Situated at the Western Ghats, Coimbatore, stores in many sightseeing spots and is well connected with air, rail and road. 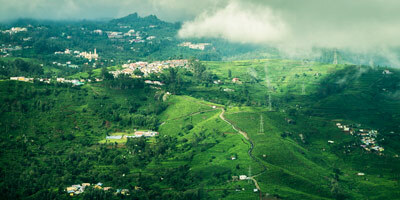 Ooty is a fabulous hill station located in the vicinity of this second largest city of Tamil Nadu. There is no direct train between Coimbatore to Ooty, as such you can catch the Nilgiri Blue Mountain Express (train number 12671) from Coimbatore to Mettupalayam and then on board the Nilgiri Mountain Railway (train number 56136) for the onward journey from Mettupalayam to Ooty as the arrival time of the 12671 Nilgiri Express connects with the departure time of the 56136 Mettupalayam to Udagamandalam train. The distance between Coimbatore and Ooty by road is 87 km and can be covered in 6 hours 25 minutes however the major preference of tourists is to travel by the toy train from Mettupalayam to Ooty in their quest to experience the wonderful mountain railway journey. The lazy train from Mettupalayam to Ooty meanders through lush tea estates, mist clad mountains and astounding flora and fauna. As you gaze at the thick clouds and admire the beautiful scenic views from the windows, you would be enjoying the breeze hitting your face and the relaxing ambience the short route is going to offer. Recognized as the World Heritage Site, the marvellous train is worth a ride. Reservations for the toy train should be done 2-3 months in advance as people prefer boarding the toy train rather than the road transport to make the most of their trip to Ooty. Online reservations can be done through Indian Railways website www.irctc.co.in. The train has first class, second sitting and the general coaches to be chosen according to your comfort level. The reservations for the Nilgiri Express can also be done online. No restrooms in toy train use them at Railway Station before boarding. There is no catering services in the toy train hence do pack your Tiffin boxes. The journey aboard the toy train that is full of twists and turns is worth a ride as it offers an extraordinary train travel experience.